High quality and well detailed, it has openable front doors and hood. 2017 Corvette Grand Sport. Ideal for collectors or great as a children's toy. 1:24 Scale 17cm approx length. New, in package. 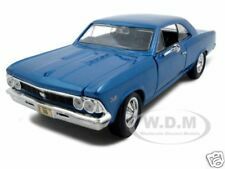 You will receive one Maisto Custom Shop Diecast 1:24 Highway Patrol 1966 Chevrolet Chevelle SS 396 It has no visible damage to packaging. Never opened. Check photos for condition. We take great care in packaging products for shipping. With the collector in mind. Smoke free establishment. Feel free to make a respectful offer. Thanks for viewing my item. 1:24 Scale 1950 CHEVROLET 3100 PICKUP. high quality and well detailed, it has openable front doors and hood. Color : ORANGE. MAISTO 1969 CHEVY CHEVELLE SS DRAGSTER GREEN 1:24 SCALE DIECAST W/BLOWER MOTOR.USED,NO BOX, IN GOOD COLLECTORS CONDITION. 1970 CHEVROLET NOVA SS DIECAST CAR 34262. MAISTO 1:24 SPECIAL EDITION. Model:1970 CHEVROLET NOVA SS. Opening: Hood, Doors, Trunk. GOLD COLOR. Made by Maisto this sturdy model is strongly made and includes Perfect for Garden Railways or as a base for a more detailed model on its own. 1965 Chevrolet Malibu SS Yellow 1:24 Diecast Car. Color: Yellow. Scale: 1:24. Maisto 2017 Chevy Corvette Grand Sport 1:24. Scale: 1:24. Exterior Color: Blue. Open Hood, Doors. 1968 Chevrolet Camaro SS 396 Convertible 1:24 Diecast Car. Color: Blue. Scale: 1:24. 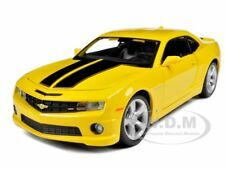 2010 Chevrolet Chevy Camaro 1:24 scale diecast model car. Both front door and the hood can be opened with detail engine inside. 2010 Chevrolet Chevy Camaro police. Both front door and the hood can be opened with detail engine inside. It is a Special Limited Edition for the Salt Lake Olympic Torch Relay. Who is Jon Moss?. That is just the tip of the iceberg from what he has done. 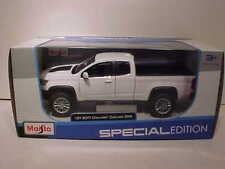 Jon Moss Signature 2006 Silverado 1500 Regency RST Edition. Maisto 2017 Chevy Camaro ZL1 1:24. Scale: 1:24. Exterior Color: Blue. Open Hood, Doors. 2014 Chevy Corvette Stingray Convertible Yellow 1:24 Diecast Car. Color: Yellow. Scale: 1:24. 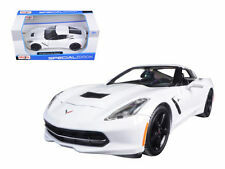 2015 Chevrolet Corvette Z06 1:24 scale diecast collectible model car. Manufactured by Maisto. Blue body with black interior. 1968 chevy camaro. Opening bonnet reveals beautifully detailed engine bay and opening front doors reveal a detailed interior! Brand: Maisto Condition: Very Good Flaws: A few ( Please See Pictures for details) ** PLEASE SEE ALL PICTURES ** Any questions please feel free to message me! Fast free shipping in the USA via USPS. Payment: We Only Accept PayPal. Smoke & Pet Free Home. Shipping: We ship all items within 1 business day of your payment clearing (excludes weekend and holidays) Items that are purchased after 3pm on Friday may not be shipped until Monday morning. Thank you!! Features - Rolling wheels and opening hood and doors. Maisto 1968 CHEVY CAMARO Z/28 scale 1/24 New in Box. Made By Maisto. it has Opening doors, trunk. Maisto Special Edition. '1968 Camaro SS 369 Convertible'. Made By : MAISTO. HARLEY DAVIDSON 1970 CHEVROLET CORVETTE 1/24. Color : BLACK / ORANGE. We will do our best to reply as soon as possible. Opening : HOOD, DOORS. Chevrolet Grand Sport 2017 dk grey. MANUFACTURER - Maisto. They all look fantastic, small price for highly detailed model. Suitable also for G scale Layouts and 24th scale dolls houses. Chevrolet Corvette 1959 - Black. Maisto Diecast Icons. 1965 Chevrolet El Camino. 1/24 Diecast Car. 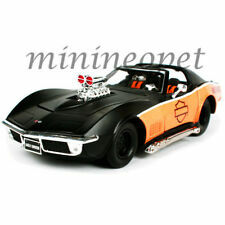 1970 Chevrolet Corvette with Black Wheels Diecast Model 31202. Made By Maisto. With Black Wheels. Scale 1:24. Opening:Hood,Doors. Manufacturer: Maisto. The details of this diecast replica are incredible! Features detailed interior and realistic dashboard, real rubber tires, detailed engine, opening doors. Color: Grey. Therefore owning it is like owning the real car. 2014 1:24 Scale Chevy Corvette Stingray 7.5" Long diecast model car. Openable front doors and hood with detailed engine. Free wheeling car, Rubber tire on each wheel. 1970 Chevrolet Corvett Diecast Car. Model:HARLEY-DAVIDSON CUSTOM 1970 Chevrolet Corvett. MAISTO 1:24 W/B HARLEY-DAVIDSON CUSTOM. Color:MATTE BLACK And ORANGE. 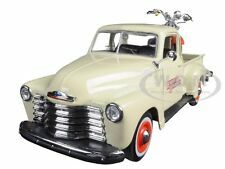 1:24 Scale 1950 CHEVROLET 3100 PICKUP. 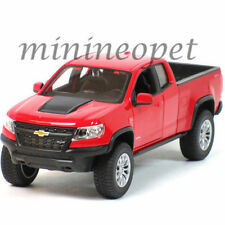 high quality and well detailed, it has openable front doors and hood. Maisto 1:24 RC Chevrolet Camaro SS, with the frequency noted on the packaging to allow customers to buy multiple cars on different control frequencies for simultaneous play. It features full function control. Product Code: 30339.